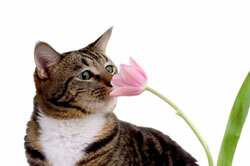 Did you know that many common garden and house plants can be toxic to your cat? In fact, the American Society for the Prevention of Cruelty to Animals lists over 390 that are poisonous—primarily when ingested.1 Some may even cause death. If you suspect that your pet has ingested something poisonous, please do not hesitate to call your veterinarian or the ASPCA Animal Poison Control Center at 888-4ANI-HELP (888-426-4435). If you have general concerns that something in your pet's environment is impacting his or her health or well-being, please consult with your veterinarian. Please note that while I make all efforts to provide up-to-date, valid information, I cannot guarantee the accuracy of the information. Also, the plants list is not meant to be all-inclusive. Small clusters of green berries that turn red-orange. Large, broad leaves, which can be arrow-shaped. Flower is a sheath-like hood over a spike with tiny clusters. Mouth irritation and burning sensation. Base clusters of green, succulent, long, often spiny leaves. Red, pink, white, or yellow flowers are tubular and occur in clusters on thin stems above the leaves. Red, orange, or black fruit. Grows to 1.5 feet high. Each plant has two large five or nine-lobed leaves (some up to a foot wide). The leaves shelter a single white, drooping, 2-inch wide flower. Clusters of small, fragrant white or pink flowers. Crab apples are smaller than eating apples. Fleshy fruit with multiple small seeds. Mucous membranes turn brick red. Small 2-inch leaves with pointy tip. Pink or white 5-petaled flowers. Orange to red fruits with single pit inside. Leaves are arrow-shaped and mottled in color. White or light violet flowers that only appear in late summer or autumn. Long leaves in spring that die back before plant flowers. Pointed oval dark green leaves. Trees can grow to more than 65 feet tall. Fruit varies in size from 4 to over 10 inches long with a rough skin darker than the interior flesh, and a large central seed. Rhododendrons usually have thick leathery evergreen leaves. Azaleas usually have thin deciduous leaves. Dense clusters of large bell-shaped flowers in a wide variety of colors. Weak heart rate and cardiovascular collapse. Grows between six and 30 inches tall. Broad, shiny leaves can be red or green, and sometimes striped or multi-color. Small 4-petaled red, white, orange, or pink flowers, two of the petals are much smaller. 3-lobed green leaves that turn red in the autumn. Usually flowers in spring, with small yellow or cream flowers with five or more petals. Grows to low or moderate height. Multiple leaves can be variable in shape—sometimes divided, lobed, or veined—and alternate on the stem. Large, arrow-shaped multiple-colored leaves with a variable color mix of green, white, red, and pink. Hooded flowers on singular stalks. Similar to American elderberry tree. Fast-growing tree; can grow to 50 feet tall. Purple-tinged, brown-spotted twigs, large blue-green leaves that turn yellow in autumn. Clusters of small flowers in the spring, with five pink petals around a central deep purple and red tube. Two to three-inch long blue-green needles, two to a sheath. Can reach 75 feet in height if left to grow. One to five feet tall. Multiple colors and petal counts, depending on type. Small to large flowers, sometimes clustered; multiple colors, including white, pink, red, or purple. Densely clustered red or black berries. Vine can be trailing or climbing. Flowers and fruits are in a sac that turns color from green to reddish orange and then a deep purple-tinged black. Two-part flowers—a central cup with a flat base ring of six structures that look like petals. Flat or sheath-like leaves, but not on flower stalk. Blooms in spring for up to three months in warmer regions. Low blood pressure and irregular heart rhythms. Large mottled white, yellow, and green leaves. Can grow up to five or more feet high. Large, oval, pointy-tipped leaves with hairy undersides at the base of the plant. Tall stalks with clusters of tubular, drooping, pink/purple or white/yellow flowers. The lower lip of the flower is usually spotted purple or brown. Typically between four and six feet tall. Large clustered white flowers bloom July through August. Trumpet shaped flowers with six petal-like parts. Grows six to twelve feet tall. At the base of the plant, leaves grow opposite each other; at the top they alternate and are divided into palms of three to seven small leaves. Leathery oblong leaves grow opposite each other on green-colored branches. Climbing vine with large funnel-shaped flowers in blue, purple, red, white, and contrasting colors. Hooded, spiked cluster of flowers that rarely form when grown inside (as opposed to the tropics). Large, alternating, glossy, dark green leaves. White, purple, pink, or bi-colored flowers. Some have fragrant blooms from early spring through summer. Pressing head against wall or other object. Downy toothed or lobed leaves. Most varieties produce fruit that turns red when mature. The common garden tomato is actually a berry, with many small seeds. In the U.S.: Cultivated throughout the country. Cup-shaped, single flower per stem. Outer layers of bulbs are dry and papery. Fragrant lavender flowers that produce pods with brown seeds. The common garden tomato is actually a berry, with many small seeds. vine. Fragrant, red or white flat, wide flowering heads. Reaches up to 20 inches in height. Feathery green leaves, mostly clustered at base of flower stalk. Blooms summer to early autumn. In the U.S.: Northern temperate regions. Typical shrub grows one to three feet. Twig bark is green on younger branches and reddish-brown on older twigs. Needles tinted red in winter. The American Society for the Prevention of Cruelty to Animals. ASPCA: Pet Care: Animal Poison Control Center: Plants: Toxic and Non-Toxic Plants. The American Society for the Prevention of Cruelty to Animals. [Online] 2010.http://www.aspca.org/pet-care/poison-control/plants/?plant_toxicity=toxic-to-cats. Plants: Adam-and-Eve. ASPCA Pet Care: Animal Poison Control Center. [Online] 2010. http://www.aspca.org/pet-care/poison-control/plants/adam-and-eve.html. Turner, Nancy J. and Aderkas, Patrick Von. The North American Guide to Common Poisonous Plants and Mushrooms. s.l. : Timber Press, 2009. ISBN 0881929298, 9780881929294. The American Society for the Prevention of Cruelty to Animals. Plants: Aloe. ASPCA Pet Care: Animal Poison Control Center. [Online] 2010. http://www.aspca.org/pet-care/poison-control/plants/aloe.html. Plants: Amaryllis. ASPCA Pet Care: Animal Poison Control Center. [Online] 2010. http://www.aspca.org/pet-care/poison-control/plants/amaryllis.html. Powell, Eileen. The gardener's A-Z guide to growing flowers from seed to bloom. s.l. : Storey Publishing, 2004. ISBN 1580175171, 9781580175173. The American Society for the Prevention of Cruelty to Animals. Plants: American Bittersweet. ASPCA Pet Care: Animal Poison Control Center. [Online] 2010. http://www.aspca.org/pet-care/poison-control/plants/american-bittersweet.html. Nelson, Lewis, Shih, Richard D. and Balick, Michael J. Handbook of poisonous and injurious plants. s.l. : Springer, 2007. ISBN 0387312684, 9780387312682. The American Society for the Prevention of Cruelty to Animals. Plants: American Holly. ASPCA Pet Care: Animal Poison Control Center. [Online] 2010. http://www.aspca.org/pet-care/poison-control/plants/american-holly.html. Council on the Environment of New York City. Poisonous and Injurious Garden Plants. Council on the Environment of New York City: The City Lot. [Online]http://www.cenyc.org/files/citylot/Poisonous_And_Injurious_Garden_Plants.pdf. The American Society for the Prevention of Cruelty to Animals. Plants: American Mandrake. ASPCA Pet Care: Animal Poison Control Center. [Online] 2010. http://www.aspca.org/pet-care/poison-control/plants/american-mandrake.html. Plants: Apple. ASPCA Pet Care: Animal Poison Control Center. [Online] 2010. http://www.aspca.org/pet-care/poison-control/plants/apple.html. Brockman, Christian Frank and Merrilees, Rebecca A. Trees of North America: a field guide to the major native and introduced species north of Mexico. s.l. : Macmillan, 2001. ISBN 1582380929, 9781582380926. The American Society for the Prevention of Cruelty to Animals. Plants: Apricot. ASPCA Pet Care: Animal Poison Control Center. [Online] 2010. http://www.aspca.org/pet-care/poison-control/plants/apricot.html. Plants: Arrow-Head Vine. ASPCA Pet Care: Animal Poison Control Center. [Online] 2010.http://www.aspca.org/pet-care/poison-control/plants/arrow-head-vine.html. Russell, Alice B. Poisonous Plants: Syngonium podophyllum. North Carolina State University Department of Horticultural Science: Poisonous Plants of North Carolina. [Online] 1997.http://www.ces.ncsu.edu/depts/hort/consumer/poison/Syngopo.htm. Barceloux, Donald G. Medical Toxicology of Natural Substances: Foods, Fungi, Medicinal Herbs, Plants, and Venomous Animals. s.l. : John Wiley and Sons, 2008. ISBN 047172761X, 9780471727613. The American Society for the Prevention of Cruelty to Animals. Plants: Autumn Crocus. ASPCA Pet Care: Animal Poison Control Center. [Online] 2010. http://www.aspca.org/pet-care/poison-control/plants/autumn-crocus.html. Plants: Avocado. ASPCA Pet Care: Animal Poison Control Center. [Online] 2010. http://www.aspca.org/pet-care/poison-control/plants/avocado.html. Hogan, Sean. Trees for All Seasons: Broadleaved Evergreens for Temperate Climates. s.l. : Timber Press, 2008. ISBN 0881926744, 9780881926743. The American Society for the Prevention of Cruelty to Animals. Plants: Azalea. ASPCA Pet Care: Animal Poison Control Center. [Online] 2010. http://www.aspca.org/pet-care/poison-control/plants/azalea.html. Plants: Begonia. ASPCA Pet Care: Animal Poison Control Center. [Online] 2010. http://www.aspca.org/pet-care/poison-control/plants/begonia.html. Wyman, Donald. Wyman's Gardening encyclopedia. s.l. : Simon and Schuster, 1986. ISBN 0026320703, 9780026320702. Eldredge, Debra M., et al. Dog Owner's Home Veterinary Handbook. s.l. : John Wiley and Sons, 2007. ISBN 0470067853, 9780470067857. The American Society for the Prevention of Cruelty to Animals. Plants: Buttercup. ASPCA Pet Care: Animal Poison Control Center. [Online] 2010. http://www.aspca.org/pet-care/poison-control/plants/buttercup.html. Plants: Caladium. ASPCA Pet Care: Animal Poison Control Center. [Online] 2010. http://www.aspca.org/pet-care/poison-control/plants/caladium.html. Russell, Alice B. Poisonous Plants: Caladium. North Carolina State University Department of Horticultural Science: Poisonous Plants of North Carolina. [Online] 1997.http://www.ces.ncsu.edu/depts/hort/consumer/poison/Caladsp.htm. The American Society for the Prevention of Cruelty to Animals. Plants: Chinaberry. ASPCA Pet Care: Animal Poison Control Center. [Online] 2010. http://www.aspca.org/pet-care/poison-control/plants/chinaberry-tree.html. Reemts, Charlotte. Chinaberry. Plant Conservation Alliance Alien Plant Working Group. [Online] July 7, 2009.http://www.nps.gov/plants/alien/fact/meaz1.htm. Osborne, Carol. Dr. Carol's Naturally Healthy Cats. s.l. : American Pet Institute, 2006. ISBN 0977895017, 9780977895014. Peterson, Michael Edward and Talcott, Patricia A. Small animal toxicology. s.l. : Elsevier Health Sciences, 2006. ISBN 0721606393, 9780721606392. The American Society for the Prevention of Cruelty to Animals. Plants: Chrysanthemum. ASPCA Pet Care: Animal Poison Control Center. [Online] 2010. http://www.aspca.org/pet-care/poison-control/plants/chrysanthemum.html. Naeve, Linda, Jauron, Richard and Nelson, Diane. Growing Chrysanthemums in the Garden. Iowa State University - University Extension Reiman Gardens. [Online] April 2005.http://www.extension.iastate.edu/Publications/RG305.pdf. The American Society for the Prevention of Cruelty to Animals. Plants: Clematis. ASPCA Pet Care: Animal Poison Control Center. [Online] 2010. http://www.aspca.org/pet-care/poison-control/plants/clematis.html. Plants: Daffodil. ASPCA Pet Care: Animal Poison Control Center. [Online] 2010. http://www.aspca.org/pet-care/poison-control/plants/daffodil.html. Buchanan, Rita and Holmes, Roger. Taylor's Master Guide to Gardening. s.l. : Houghton Mifflin Harcourt, 2001. ISBN 061815907X, 9780618159079. The American Society for the Prevention of Cruelty to Animals. Plants: Dieffenbachia. ASPCA Pet Care: Animal Poison Control Center. [Online] 2010. http://www.aspca.org/pet-care/poison-control/plants/dieffenbachia.html. Russell, Alice B. Poisonous Plants: Dieffenbachia. North Carolina State University Department of Horticultural Science: Poisonous Plants of North Carolina. [Online] 1997.http://www.ces.ncsu.edu/depts/hort/consumer/poison/Dieffsp.htm. The American Society for the Prevention of Cruelty to Animals. Plants: Foxglove. ASPCA Pet Care: Animal Poison Control Center. [Online] 2010. http://www.aspca.org/pet-care/poison-control/plants/foxglove.html. Plants: Hydrangea. ASPCA Pet Care: Animal Poison Control Center. [Online] 2010. http://www.aspca.org/pet-care/poison-control/plants/hydrangea.html. Foster, Steven, Caras, Roger and Peterson, Roger Tory. A field guide to venomous animals and poisonous plants, North America, north of Mexico. s.l. : Houghton Mifflin Harcourt, 1998. ISBN 039593608X, 9780395936085. Wagstaff, D. Jesse. International poisonous plants checklist: an evidence-based reference. s.l. : CRC Press, 2008. ISBN 1420062522, 9781420062526. Fitzgerald, Kevin T. and Vera, Rebecca. Poisonings in the Captive Reptile. [book auth.] Michael Edward Peterson and Patricia A. Talcott. Small animal toxicology. s.l. : Elsevier Health Sciences, 2006. ISBN 0721606393, 9780721606392. The American Society for the Prevention of Cruelty to Animals. Plants: Lily. ASPCA Pet Care: Animal Poison Control Center. [Online] 2010. http://www.aspca.org/pet-care/poison-control/plants/lily.html. Plants: Marijuana. ASPCA Pet Care: Animal Poison Control Center. [Online] 2010. http://www.aspca.org/pet-care/poison-control/plants/marijuana.html. Russell, Alice B. Poisonous Plants: Cannabis sativa. North Carolina State University Department of Horticultural Science: Poisonous Plants of North Carolina. [Online] 1997.http://www.ces.ncsu.edu/depts/hort/consumer/poison/Cannasa.htm. The American Society for the Prevention of Cruelty to Animals. Plants: Mistletoe. ASPCA Pet Care: Animal Poison Control Center. [Online] 2010. http://www.aspca.org/pet-care/poison-control/plants/mistletoe-american.html. Russell, Alice B. Poisonous Plants: Phoradendron leucarpum (P. serotinum). North Carolina State University Department of Horticultural Science: Poisonous Plants of North Carolina. [Online] 1997.http://www.ces.ncsu.edu/depts/hort/consumer/poison/Phorale.htm. The American Society for the Prevention of Cruelty to Animals. Plants: Morning Glory. ASPCA Pet Care: Animal Poison Control Center. [Online] 2010. http://www.aspca.org/pet-care/poison-control/plants/morning-glory.html. Russell, Alice B. Poisonous Plants: Philodendron spp. North Carolina State University Department of Horticultural Science: Poisonous Plants of North Carolina. [Online] 1997.http://www.ces.ncsu.edu/depts/hort/consumer/poison/Philosp.htm. The American Society for the Prevention of Cruelty to Animals. Plants: Philodendron Pertusum. ASPCA Pet Care: Animal Poison Control Center. [Online] 2010. http://www.aspca.org/pet-care/poison-control/plants/philodendron-pertusum.html. Ani?ko, Tomasz. When Perennials Bloom: An Almanac for Planning and Planting. s.l. : Timber Press, 2008. ISBN 0881928879, 9780881928877. The American Society for the Prevention of Cruelty to Animals. Plants: Sweet Pea. ASPCA Pet Care: Animal Poison Control Center. [Online] 2010. http://www.aspca.org/pet-care/poison-control/plants/sweet-pea.html. Plants: Tomato Plant. ASPCA Pet Care: Animal Poison Control Center. [Online] 2010. http://www.aspca.org/pet-care/poison-control/plants/tomato-plant.html". Plants: Tulip. ASPCA Pet Care: Animal Poison Control Center. [Online] 2010. http://www.aspca.org/pet-care/poison-control/plants/tulip.html. Plants: Fig. ASPCA Pet Care: Animal Poison Control Center. [Online] 2010. http://www.aspca.org/pet-care/poison-control/plants/fig.html. Russell, Alice B. Poisonous Plants: Ficus benjamina. North Carolina State University Department of Horticultural Science: Poisonous Plants of North Carolina. [Online] 1997.http://www.ces.ncsu.edu/depts/hort/consumer/poison/Ficusbe.htm. The American Society for the Prevention of Cruelty to Animals. Plants: Wisteria. ASPCA Pet Care: Animal Poison Control Center. [Online] 2010. http://www.aspca.org/pet-care/poison-control/plants/wisteria.html. Plants: Yarrow. ASPCA Pet Care: Animal Poison Control Center. [Online] 2010. http://www.aspca.org/pet-care/poison-control/plants/yarrow.html. Plants: Yew. ASPCA Pet Care: Animal Poison Control Center. [Online] 2010. http://www.aspca.org/pet-care/poison-control/plants/yew.html.